I love popsicles. They remind of me of the beach that I so desperately need right now. But homemade popsicles have obstacles to overcome if you are looking for close substitutes for what you find in the freezer section. Commercial popsicle makers have access to tools (flash freezers to stop ice crystal formation so you won't get hard ice cubes) and ingredients (high fructose corn syrup and other chemicals to slow melting) that you don't. And that's okay, it just involves a little tinkering on our part like any other homemade item. That's half the fun! 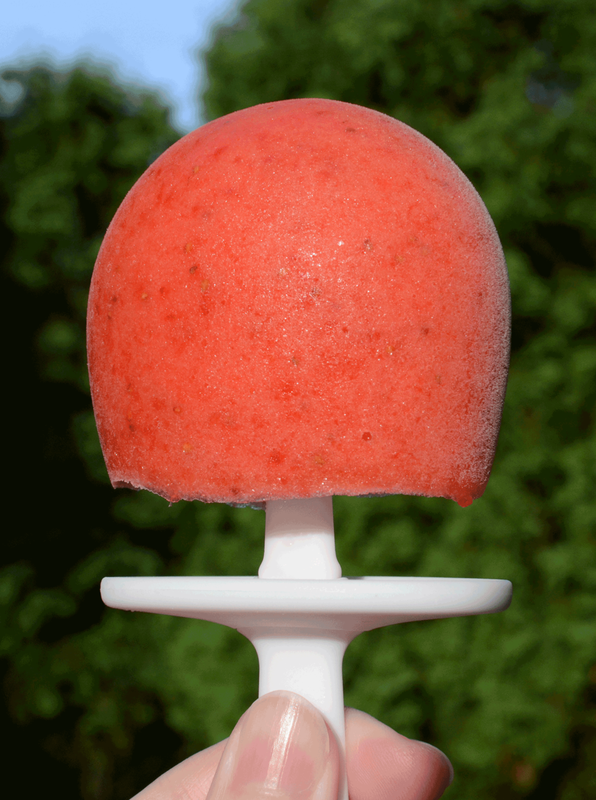 Objective: Create a popsicle that is homemade, biteable and yummy. Biteable was the trickiest part. I googled all around and learned about ice crystal formation, the speed of freezing and sugar content. After that homework was finished, I was off to the kitchen to play. I had one failure for peaches and cream, but I'm not giving up on that yet. But my success, just in time for the holiday, was strawberry lime awesomeness. Here we go. I should mention before we get started that I do use an ice cream maker to speed up freezing. Whether you do that is up to you but I've found there is a difference in biteableness. But if you don't have one, there is no reason to buy one for this project. Unless you want my recipe for Bailey's Irish Cream ice cream that I'm going to post in a couple of weeks. Might be worth the splurge. Just sayin'. Cut the tops off the strawberries, wash and put them in a blender or food processor. Add the juice of one lime and 1 tablespoon corn syrup. Puree until the mixture is as smooth as you like. TASTE. if it is sweet, you're done. If it isn't sweet enough, add another tablespoon and mix. Taste again. You can add more corn syrup if needed, but don't go overboard or you'll risk too soft sicles. Here is a trick. I then pour this mixture into the ice cream maker. I have the one that fits on a Kitchenaid mixer. Swoosh it around until it is still scoopable but not stiff; about 6 minutes. If you don't have an ice cream maker, put your blender in the fridge until the mixture is very cold. Scoop the mixture with a spoon (or pastry/ziptop bag I guess...man I wish I would've thought to do that!) into your popsicle mold or paper cups. Insert sticks. Freeze overnight. Do not peek. This recipe makes approximately 2.5 cups and I get 8 round popsicles.